Las Vegas, Nov 02, 2004 - Chrysler Group's SkunkWerks team -- a group of in-house enthusiasts brought together as part of the company's growing emphasis on performance, parts, accessories and customization -- is at it again. Made up of designers, engineers, marketers and product planners, the Chrysler Group SkunkWerks team turns their dreams into stunning performance-themed sheet metal, which often results in future directions for performance vehicles and parts. Six new SkunkWerks vehicles are on display this week at the 2004 Specialty Equipment Market Association (SEMA) show. "The Chrysler Group SkunkWerks team combines the best of engineering discipline with the excitement and pizzazz of the creative process," said Ralph Gilles -- Director, Interior/Exterior Product Design and Specialty Vehicles, and leader of the SkunkWerks team. "The result is a selection of one-off custom vehicles that may be considered dream applications, or test beds, for future vehicle and Mopar Performance parts ideas." The annual SEMA show provides a forum for the Chrysler Group to demonstrate its commitment to aspirational vehicles, while stretching the envelope in the area of vehicle customization and personalization. In addition to SkunkWerks vehicles, which represent Chrysler Group custom vehicles "straight from the factory," the Company continues to partner with SEMA members to help them create their own "dream applications" of Chrysler, Jeep� and Dodge vehicles. This year, more than two dozen such vehicles -- created by SEMA members in tandem with Chrysler Group's Image Team -- are displayed on the SEMA show floor. "The purpose is to stretch imaginations and gauge consumer interest," Gilles said. "We do that through our SkunkWerks interpretations -- and those of our SEMA partners who work with our Image Team -- pushing the envelope with Chrysler, Jeep and Dodge vehicles. At Chrysler Group, our goal is to be the leader in performance and design. Vehicles that we showcase at SEMA demonstrate that we're doing just that." Chrysler PT Cruiser customization reaches new heights with the Chrysler PT Speedster. Developed by and for true hot rod enthusiasts, the PT Speedster is equipped with a Borla dual exhaust, and generates 235 horsepower and 260 lb.-ft. of torque, courtesy of the Mopar Performance Parts Stage 1 Turbo Upgrade kit. Four-wheel slotted disc brakes with twin-piston calipers from Stainless Steel Brakes add to the PT Speedster's performance capability. The Chrysler PT Speedster's aggressive stance begins with a lowered suspension, courtesy of a Mopar Performance Stage 2 coilover suspension kit and a Mopar decklid spoiler. Budnik Wheels provided 18-inch custom wheels, which are wrapped in Bridgestone Fusion ZRi P235/40R18 tires. Mopar also contributes a sway bar kit, turbo boost gauge, blow-off valve and Hurst short-throw shifter. Custom floor mats were provided by Falcon Enterprises, and custom badging by Craft Originators. Chrysler Crossfire meets the latest motorsports craze. Powered by a 400-horsepower supercharged version of the 3.2-liter V-6 found in the Chrysler Crossfire SRT6, the ultra-lightweight Chrysler Crossfire Drifter features a variety of "drift-oriented" modifications. Its extreme stance is highlighted by a full body kit that includes a front and rear fascia with integrated ground effects, an air dam, lower rocker panels and a carbon fiber wing. A chopped windshield adds to the dramatic appearance of the Chrysler Crossfire Drifter, while a custom dual exhaust rounds out the performance enhancements. Inside, Sparco has contributed a shifter, steering wheel, racing seats and pedals. Ultra-light BBS wheels, Michelin competition tires and a special RennTech limited slip rear differential are also included. The Chrysler Crossfire Drifter is equipped with Sports Car Club of America (SCCA) Formula D rules-approved steering, suspension, exhaust and roll cage modifications. 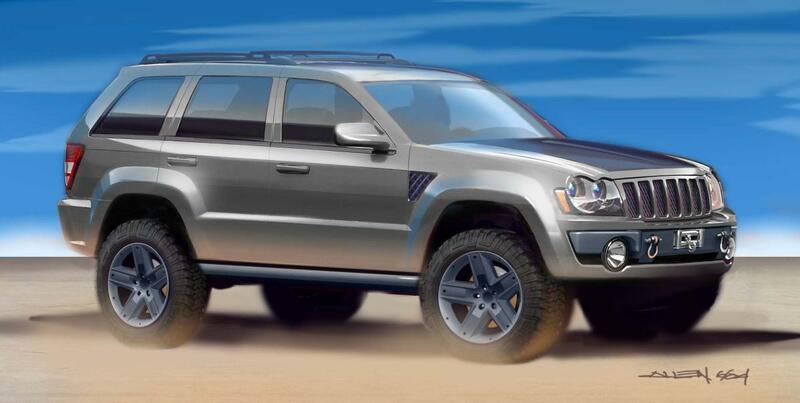 The Jeep Grand Cherokee Mojave is a rugged, trail-rated rock crawler. The Jeep Grand Cherokee Mojave features a modified 5.7-liter HEMI engine, 22-inch wheels and tires, a matte-black hood and corresponding accents, and a functional "off-road enthusiast bumper" that includes a winch and tow hooks. Inspired by the highly specialized "pre-runner" desert racing trucks, the Dodge Dakota Warrior H.O. 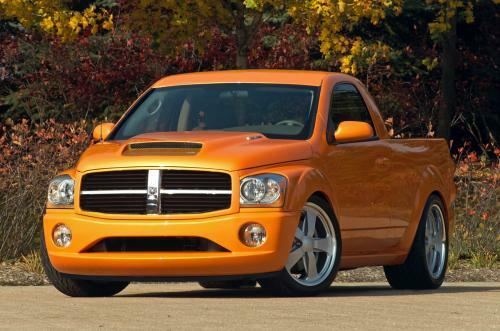 (High Output) delivers what the SkunkWerks team calls the logical evolution of the versatile Dodge Dakota Quad Cab. Powered by the Dodge Dakota's 260-horsepower 4.7-liter High Output engine, the Dakota Warrior H.O. represents the ultimate off-road mid-size pickup truck. It features a water-fording intake system, a wider track, front-bumper winch with tow hooks, decoupling sway bars and off-road tires. The interior features two-tone orange and black racing bucket seats from Katzkin. A hood scoop, wheel flares, custom spare holder, a special tubular tail gate, light bar and sport bar add to the rugged character of the Dodge Dakota Warrior H.O. A Dodge Durango as a hot rod street truck? The Chrysler Group SkunkWerks team has developed the Dodge Durango "Dude" -- powered by the 5.7-liter HEMI V-8 engine with a unique pickup configuration off the Dodge Durango platform. Modifications include a cat-back dual exhaust, lowered suspension, custom front and rear fascias, sill extensions, a composite hood inspired by the Viper-powered Dodge Ram SRT10, 20-inch billet wheels from Budnik, custom seating from Lear and PPG Tangerine Pearl paint. Developed by engineers from Chrysler Group's Street and Racing Technology (SRT) organization, who also happen to moonlight as SkunkWerks members, the Dodge "Hot Rod" Magnum gets an extra dose of performance. The "Hot Rod" Magnum includes ties to 1970 Chrysler muscle cars, including HEMI Orange paint and graphics from Kustom Haus, a '70s blackout hood treatment, 1970 Dodge Challenger exhaust tips and 1970 Dodge Charger HEMI medallions. A unique interior is highlighted by custom-leather quad seating and a full-length center console with a silver upper surface to match the shifter and center-stack bezels. Engineers added 22-inch wheels from TIS (Twenty Inches Strong), a Kicker audio system, Bilstein shocks and other SRT suspension and braking enhancements. Performance West partnered with the Chrysler Group Image Team to develop the 2005 Hurst Edition Chrysler 300C. Dressed in a two-tone pearl white/gold paint scheme, the Hurst Edition Chrysler 300C features a custom grille and hood louvers, and harkens back to an earlier era of Chrysler C-series vehicles, thanks to a new Hurst dual-gate shifter. With a low-restriction cat-back exhaust, supercharger and intercooler, power in the Hurst Edition Chrysler 300C is boosted to 500 horsepower. Other modifications include four-piston billet-caliper brakes with 14-inch rotors, a lowered, performance-tuned suspension, 20-inch alloy wheels and a unique audio/video entertainment system. Ground Force developed its Chrysler Crossfire Speedster with the Chrysler Group Image Team, creating a "1950's style speedster theme" dressed as a Crossfire. Featuring a reconstructed rear hatch and unique body cladding, the Ground Force Chrysler Crossfire Speedster incorporates performance parts from a variety of SEMA members. Power is enhanced thanks to a Green Filter custom cold-air induction system, a RennTech performance computer upgrade and a Billy Boat tri-flow titanium exhaust system. A Motec full-racing data acquisition cluster adds to the speedster theme. Torra has provided the Green Force Chrysler Crossfire Speedster.s custom 19-inch front and 20-inch rear wheels, as well as custom suede-wrapped race seats, sport steering wheel, leather hood tie-downs, racing harness and carbon fiber dash. Performance West and the Chrysler Group Image Team combined to create the Dodge Dakota T/A. The starting point was an all-new 2005 Dodge Dakota 4x2 Club Cab, equipped with a 4.7-liter V-8 engine. Power is increased thanks to a Ram Air package and a cat-back dual exhaust. Fourteen-inch slotted rotors improve braking performance, while the Dodge Dakota T/A.s aggressive stance is highlighted thanks to its 20-inch alloy wheels and ZR-rated low-profile tires. The Performance West Dodge Dakota T/A's unique appearance is a result of custom Plum Crazy Purple paint, a custom T/A six-pack hood and a Katzkin custom leather interior. Roush Industries partnered with the Chrysler Image Team to develop the Mopar Daytona Dodge Ram. The Mopar Daytona Dodge Ram features a functional shaker-hood air-induction system and a true dual exhaust system exiting through polished aluminum tips just in front of the rear tires. A Sublime Green exterior paint scheme with flat black accents and black grille inserts draws immediate attention to the Mopar Daytona Dodge Ram, as does its unique body kit that includes a deep front fascia, body-side cladding and roll pan. The Mopar Daytona Dodge Ram rides on 22-inch custom-forged, polished-aluminum wheels from Alcoa, which are shod with Pirelli Scorpion Zero 305/40YR/22 tires. 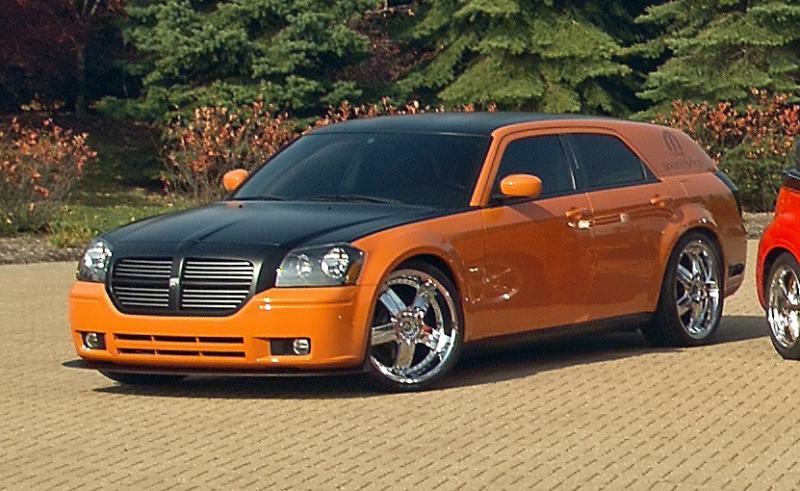 Roush Industries partnered with the Chrysler Image Team to develop its interpretation of the Dodge Magnum. Featuring a monochromatic silver paint scheme with matte black accents, the Roush Industries Magnum.s body kit includes custom front and rear fascias, a custom grille, blacked-out side windows and custom "upper-mid" rear wings. Performance upgrades include larger brakes, dual rear exhaust and a lowered, stiffer suspension. While technically not a Chrysler Group SkunkWerks or Image Team vehicle, the SkunkWerks team is recognizing the efforts of a group of students from Ann Arbor, Mich.-based Washtenaw Community College, who developed their own interpretation of the Dodge Magnum. They dubbed it the Purple Rain Dodge Magnum. The Purple Rain Dodge Magnum, which sports Oasis 22-inch wheels, includes a JL Audio system, handmade billet aluminum grille, custom cold-air induction system, modified Air Ride Technologies air-bag suspension and paint and graphics from Custom Cars and Concepts. It.s on display in Mopar Alley at the SEMA Show.